A strong social media presence is imperative these days as everyone relies on his or her smartphone, mobile device or computer to stay connected to the world. With a couple quick taps on the keyboard, you can access anything in mere seconds. Through social media, agents can acquire leads and referrals quickly but it is imperative to understand its power and capability in order for it to be a benefit. With its ability to connect people worldwide, social media marketing is a smart move for real estate agents to make. Real-time communication makes social media platforms extremely helpful to both businesses and individuals. According to Inman News, to professionally promote yourself and your business, keep the following elements in mind when developing your social media presence. Be careful not to overload your followers with updates, whether they are personal or professional. Make sure that everything you and others post to your various pages is appropriate. In an age where nothing is private once placed somewhere online, it takes only one inappropriate or offensive comment to damage a reputation or relationship. While it is important in this industry to maintain an online presence, one wrong move could cost you vital referrals. Word spreads quickly, especially online, and you do not want to ruin your name or professional reputation by posting inappropriate content. Proofread before posting to any and all of your social media platforms. 2. Maintain a personal connection. People often feel a disconnect when communicating solely online; actively pursue a robust online presence that gives people the instant comfort of knowing that an actual person is behind these posts (and not just an automated system). Even if you decide to schedule regular uploads on your various social media platforms, I cannot stress enough the importance of tailoring these posts to your particular clientele. Don’t make the mistake of focusing too heavily on generic postings only to increase your daily or weekly numbers — people will notice that the quality of your posts decreases as the quantity increases. When it comes to social media, your success relies on the scope of your online reach. This means more than just the number of friends you have on Facebook or the number of followers you have on Twitter. Reach includes how often your friends and followers share your profile or content with other online viewers. Encourage your contacts to spread the word about you and your business; social media allows the concept of word of mouth to escalate into a viral spread of information — in a much shorter timespan. Think about how you make a big decision in your own life. We ask people we know and respect for their opinions, and we take both their recommendations and their warnings seriously. Make sure to get your information out through social media in order to increase the number of people who have connections to you. The adage “a picture is worth a thousand words” also applies to social media. To have a strong social media platform, the use of photos is essential. Visual marketing is taking hold and growing rapidly. People do not always take the time to read much when scrolling through their online feeds; pictures stand the best chance at capturing your audience’s attention. When posting to sites like Facebook and Twitter, keep in mind that a post with a photo and a small caption is more likely to be shared than text alone. 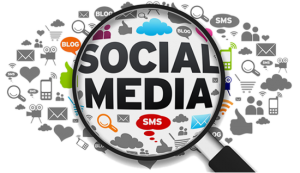 Diligence is essential to the successful development of your various social media platforms. A strong online presence takes time; do not be discouraged if your sites do not take off immediately. 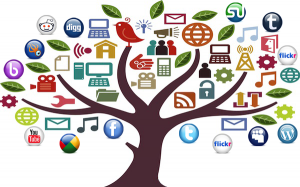 Continue to work at these social media marketing elements and keep the big picture in mind. Over time, your online presence will grow, and you can better refine it to meet the needs and desires of your specific target audiences. 5. Utilize the scheduling features. Scheduling regular posting times on your social media platforms does not mean you have to sacrifice a personal touch in these posts. It is beneficial, to both you and your online viewers, to maintain a sense of regularity in terms of posting to your social media profiles. Time management is essential, especially as duties continue to pile up. Take advantage of the newer scheduling options available to you and your business’s social media platforms; schedule specific dates and times for certain posts to go out. Keep holidays in mind; the scheduling features make it very easy for you to create posts tailored to each holiday and then focus more intently on developing your more elaborate posts. Are you ready to increase your social media presence? 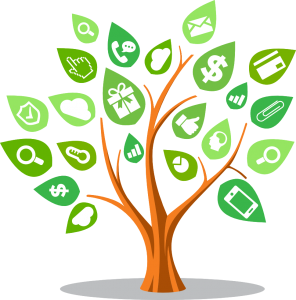 At AnotherME, our virtual assistants can help you grow your online reach. Call us today at (770) 414-9393 for more information. So perhaps you have tried some of our tips from our last segment on “How to Grow Your Database in 2015” and now you are ready for more suggestions on how to reach out to your sphere of influence and remain relevant to them. Well, here are five more creative strategies that are not only effective, but also fun. By creating a lasting relationship with your clients, you are opening the door to easier prospecting, endless referrals and repeat business, which translates to listings, closings and success! Be visible in the community. Set up a charity event for your local town or community. Think: Toys for Tots, Coats for the Cold, Thanksgiving Dinners or other holiday drives will all help to contribute to having your name at top of mind. Save 5 times the marketing dollars. In today’s market, it can cost up to five times more to acquire a customer than it does to keep current ones. Retaining customers is the next step in managing the relationship to keep the client for life. Client relationship management (CRM) is a key action step that you need to continually nurture and maintain strong relationships with this important segment of your database. Host a Unique Party! Everyone enjoys a fun summer outdoor party!! Invite your past clients, current clients and strategic partners. Create a theme with plenty of fun activities for kids like face painting and games. It’s a great way to stay connected! Let’s face it – maintaining your database is not the most glamorous job…it takes time, it takes effort and most of all, it takes creativity but it is ESSENTIAL. You have worked diligently to build your sphere of influence therefore you must remain relevant to them. Your clients needs to managed, categorized, and nurtured before, during and after a sale, whether they were a Seller and you successfully marketed their home or they were a Buyer and you provided them with an exceptional contract-to-close transaction. When nurtured and serviced after the sale, your client relationship opens the door to easier prospecting, endless referrals and repeat business. So, how do you remain relevant to your clients? Be a resource! Set up monthly or quarterly real estate events so that people can learn what they need to do to buy or sell real estate. Making it a joint venture with attorneys, title companies, credit repair services will enable you to meet even more people to grow your database. Send a note! If you are just plain embarrassed because you haven’t connected, think about sending a fun note that states, “I’ve missed you!” and include a call to action to get information about neighborhood news, property updates or current real estate activity in their area. Build your database effortlessly, cheaply and easily. Many agents are so busy working with current prospects that they can’t keep up with prospecting for new customers. If your present website isn’t working 24/7, you will lose the prospecting and marketing edge. Be smart and choose a website that is effective at managing your prospecting leads. It’s easier to sell an existing customer. You have a better chance of selling to an existing customer (60%) than a new prospect (the percentage plummets from 60% to as low as 5-20%). 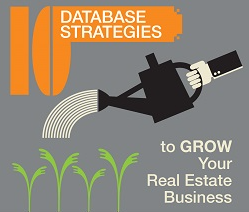 Take at least one day per week to work on your database. Starting today, work backwards to organize, review and upload customer information so you can begin the process of contacting, nurturing and informing. Customers are your most important asset and they are critical to growing your business. The closing may signal the end of a journey together, but actually it is the gateway to future business. You need a program that will deploy relevant information to keep your name on the top of their mind. There are countless real estate software programs to help organize your contacts before, during and long after the transaction has been closed. Explore your options to see which platform works best for your business. It is with great sadness that we closed out the month of September with news on Beverly Carter, the Arkansas Realtor who went missing last week and whose body was found Tuesday morning. Beverly was on her way to meet a prospective buyer at a foreclosed property she was showing. Prior to this horrendous incident, articles have been circulating and Brokers, Agents and Associations have been promoting safety awareness as September is REALTOR® Safety Month. 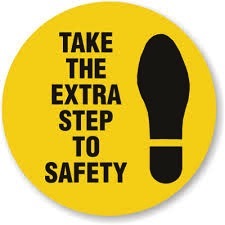 As situations would have it, safety can not be emphasized enough. There is no doubt that you are aware of the potential risks that are involved in showing property and meeting with potential clients. The question is, what precautions do you take, if any, to handle an unsafe situation, should it arise, and what are you doing to keep yourself educated and abreast of potential hazards? Fortunately, great information is out there and easily accessible. A great place to start is with your state associations and National Association of REALTORS® (www.realtor.org). There are numerous and extremely informative safety brochures and pamphlets you can download and multiple webinars and videos covering everything from what an attacker looks for to common sense safety techniques. There are also several independent companies that specialize in Personal and Business Safety. In addition, there are several GPS tracking apps available for your phone and/or tablet. The use of these apps make it possible for individuals that you have selected, to see and track your location at any given time. One app, STAY SAFE (www.staysafeapp.com) allows the user to set up the time duration that they will be somewhere and if they fail to check-in with their contact(s), an emergency text and/or email is sent out. Another app, Watch Over Me (www.watchoverme.com), is similar in its GPS tracking and emergency contact alerts, but goes one step further in allowing the user to video tape and voice record when the user triggers an SOS by simply shaking the phone. Lastly, don’t ignore your own gut instinct when it comes to safety. Become best friends with the voice in your head that alerts you that “something doesn’t feel right” and don’t get “comfortable” with that “uncomfortable” feeling by trying to justify the situation. With information and resources at our fingertips, go forward into October educated and prepared. Cute Infographic courtesy of Allstate! Infographic courtesy of The Allstate Blog. this is a sample featured post item.